Mindfulness through Art is an art therapy workshop designed to encourage cognitive/emotional awareness and personal development through mindfulness practices, creative self-expression, and play. –The children will be introduced and invited to participate in informal mindfulness practices. –Art activites may incled clay work, creating puppets, mural making, creating t-shirts, painting, drawing, sculpture, etc. All art materials used are non-toxic and child safe. —Provide mental health support for serious environmental issues in the home(divorce, family conflict, etc. ), or in the community. Parents with these concerns should contact me directly at studio@annielistonwalters.com and I will happily offer individual sessions or refer you to a support system that would better address your needs. Full payment must be received at the time of enrollment. This workshop is non-refundable, but the balance may be used toward future workshops held by Annie Liston Walters, Art Therapist. If your child is absent from a workshop session you will not receive a refund for missed dates. Absences may be used towards the cost of future workshops held by Annie Liston Walters, Art Therapist. If for unforeseen circumstances we must cancel the workshop prior to commencement, you will be fully refunded. Annie Liston Walters, Art Therapist, is not a childcare agency. If a child is not picked up by 12:00 pm, a child minding fee will be charged. This rate is charged by the minute($3/minute) beginning at 12:00 pm. A primary pick-up person must be identified on, or prior to, the first day of the workshop. A brief list of trusted adults may be listed as alternatives for pick-up. Annie Liston Walters must be personally informed, by phone, of any changes in pick-up plans. All information shared within the workshop sessions will remain confidential and will only be shared during *supervision. Personal information will be kept in a double-locked format in a secure location. All information shared within the Mindfulness and Storytelling group will remain confidential. Participants of the workshop will be asked to keep what is shared within the group confidential, but Annie Liston Walters, Art Therapist cannot guarantee that they will do so. All artwork is considered a part of the therapeutic process and must be taken home by the participants on a weekly basis. Any artwork left on the premise will be kept by the facilitator until the end of the eight-week workshop at which time it may be discarded at the discretion of the facilitator. *Supervision: Information shared and experiences that occur within the workshop will be discussed with an art therapy supervisor who is both a Registered Psychotherapist and Registered Canadian Art Therapist. Personal information of the participants will not be shared during supervision. Supervision is a required element in mental health practices to ensure that the clients are being thoroughly supported and to ensure that the facilitator is using safe and effective practices. DUTY TO REPORT: As a professional working with children, it is my legal duty to report any suspicion of child abuse or neglect. It is also my legal duty to contact the police if it becomes apparent that a participant, or anyone involved, is capable of inflicting immediate physical harm to themselves or others. This workshop and all of its contents are the intellectual property of Annie Liston Walters, Art Therapist and may not be used, disseminated or replicated without express permission from Annie Liston Walters, Art Therapist. Annie Liston Walters, Art Therapist is a licensed and insured company. Annie Liston Walters considers physical safety to be the top priority when working with clients. While the risks involved in participating in this workshop are minimal, by signing this form you are providing consent for you or your child to receive medical treatment in the event of injury, accident, and/or illness during this activity. By signing this form you agree not to sue Annie Liston Walters, Art Therapist, and her employees. 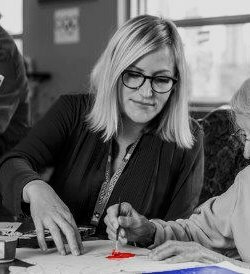 As a Professional Art Therapist with the Canadian Art Therapy Association, Annie Liston Walters, Art Therapist is bound to adhere to and operate within the ethical boundaries set by the association. Any complaints on ethical matters concerning Annie Liston Walters, Art Therapist may be addressed to the CATA ethics board and action will be taken to address your concerns.